Participating museums offer free or greatly reduced admission fees year round to Supplemental Nutrition Assistance Program Electronic Benefit Transfer cardholders. By promoting affordable museum experiences, the program bolsters the role of museums as community anchors. This initiative aims to double the number of participating museums; expand visits to all kinds of museums; establish an online community of practice; and gather evaluative data to support the long term sustainability of the program. 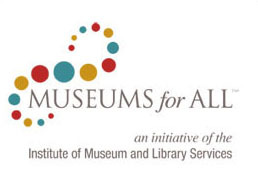 To find a list of participating museums, or to sign up for the program, please visit the Museums for All website.